Here's a look at an application we've recently developed that can visualize residential listings for New York City. This application allows us to fetch all listings in one or more buildings and use high quality phototextured models of the subject properties. An example is shown above with the supertall skyscraper One57 in Midtown Manhattan. 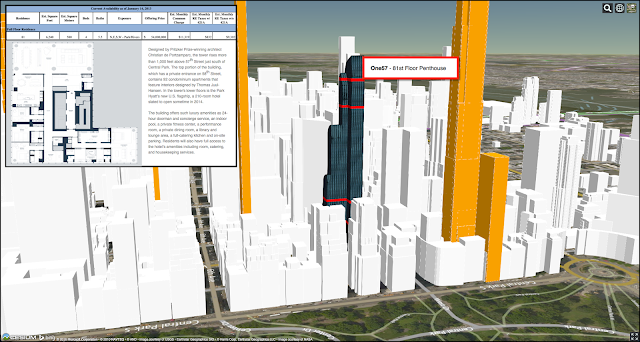 Combining residential listing data feeds with 3D interfaces like those developed by Cube Cities is a powerful way to analyze market data. It becomes possible to see exactly where space is located in a building and so the views and floorplans are more easily understood. Users can even see the real-world views automatically with this type of 3D application. Our residential application can be used to showcase sale or rental listings and can easily receive data from standard industry data feeds or internal private data using Excel files.